MK Yisrael Eichler attacks Supreme Court judges for demanding female representation in haredi parties. 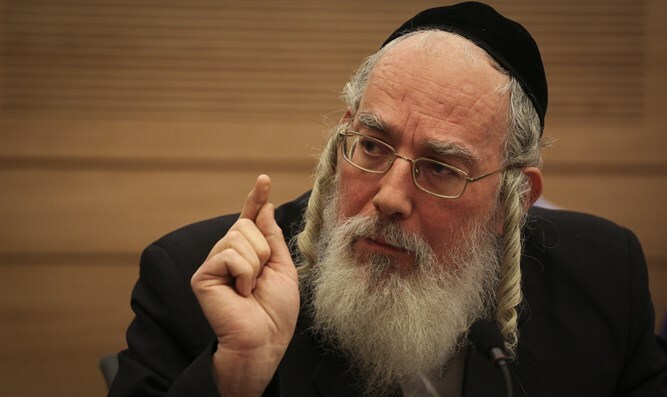 MK Yisrael Eichler of United Torah Judaism (UTJ) attacked the Supreme Court judges today in a Knesset meeting for demanding to know why there are no haredi women on the lists of the haredi parties. “It was announced on the news that the Supreme Court demands that UTJ answer within two-and-a-half months as to why it will not include women in its Knesset list. I ask: Why don’t they hold elections for the Supreme Court on the same day they hold elections for the Knesset? “If the justices of the Supreme Court establish rules and limitations on the right to political representation in the Knesset, then why don’t the citizens establish limitations on the rights of courts to interfere? Before the judges establish the makeup of the parties, why don’t the millions of voters come together and choose judges for the Supreme Court?” Eichler fumed. Every group in Israel is allowed to form a political party. “Israel doesn’t limit the right of pensioners to form a party for pensioners or religious from forming a party for the religious or Arabs to form a party for Arabs. Even if there were no Jewish state here, haredi Jews would be allowed to form a haredi party; that’s how it was in Poland and other countries. “There are countries in the Middle East in which the rulers establish what the parliamentary lists will look like - and look at what goes on in those places. The very thought that the Supreme Court would negate the right of UTJ to form the makeup of its own list, which is does in accordance with our Torah giants' instructions is a declaration of war against democracy in general - and haredi citizens in particular. It is our right to live in the land of our forefathers according to our precepts. No Jewish or foreign government can tell us how to live. “He who denies the bond of Jewish law and tradition according to the Torah giants of UTJ is no different from UNESCO denying the bond of Judaism to the Western Wall. Just as we condemn UNESCO, we ought to condemn every attempt to infringe on the right of the haredi citizen to choose his representatives,” he concluded.